Sylvia is a gentle older lady who is getting her things together so she can go out to her garden and plant some seeds. She is wearing a long sleeve floral print cotton blouse with nice pearl buttons down the front of it with a pair of soft purple slacks. Her hair is a soft silver curl cut short to her head. She made herself a special ‘gardening apron’ to wear while she plants. It is purple and has two nice large floral pockets to hold her seeds and trowel. Her gloves are in her right hand and she’s ready to get started! 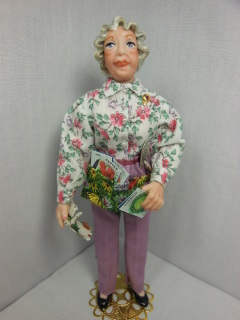 Sylvia is gently posable at her shoulders and elbows. She stands around 5.3” tall. Ms. Maize is a gentle soul who loves to bake and take care of her home. 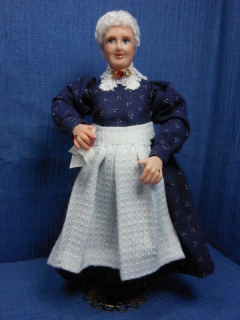 She is wearing a navy blue with tiny white dot print dress made of cotton. Her white apron covers the front of her dress to keep it clean while she does her chores. She also wears a slip, pantaloons, and white cotton hose. Her hair has turned white and she wears it in a fashionable short cut. On her white lace collar she has clasp her favorite broach of gold with a faux ruby in the center of it. She also has a faux ruby ring on her right hand, a gold wedding band on her left. Her shoes are navy blue leather pumps with tiny bows on them. Ms. Maize stands just shy of 5.3” tall. Her arms are gently posable at the shoulders and elbows.